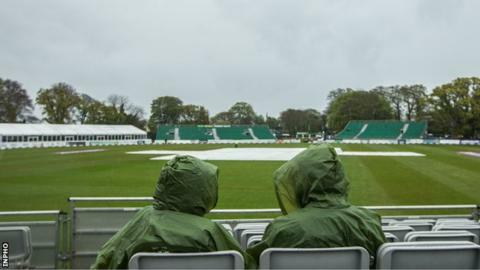 Ireland finished third in the ICC World Twenty20 Qualifier after their final play-off game against Hong Kong was washed out at Malahide on Sunday. Persistent rain led to the third-fourth place encounter being called off three hours after the scheduled start. Ireland secured third spot after topping their group, although both teams had already qualified for next year's World Twenty20 in India. Later, Scotland face the Netherlands in the final if the rain eases off. Ireland had won the previous two qualifying tournaments but they suffered a five-wicket defeat by the Netherlands in Saturday's semi-finals. Hong Kong also lost by five wickets in their semi-final against Scotland.